One day I was walking through a video game arcade when I saw what I thought was Jet Li beating the crap out of some guy, being a Hong Kong action fan a ran to see what game it was. Now if I never saw that character I would never have played this awesome game, so I punched in a few credits and away I went. When you first play last blade you realise you are playing one of SNK's greatest fighting games, but hang on why have I never heard of this you think to yourself but that's the way SNK do things they don't seem to send out many games to other countries, which is a sad disappointment because this game is very hard to find in arcades. Any way I should tell you a bit about the game itself. 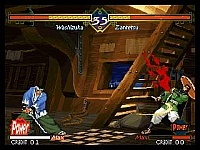 Last blade is to put it bluntly another sword fighting game but it is also very original. The animation in this game looks like a very well done anime, the characters look great with lots of different moves and combos. Not only do the characters look great but the stages are brilliantly done with many little animations like inYuki's stage when you slam them hard snow falls from trees and even off roofs. These add together to make a game that I must say kicks games like the KOF series and even the street fighter alpha series hard in the but which is a lot to say but if you have played this you will realise just how good it is. The game play in this game is totally new, when you select your character you must select a style: Speed or Power, these styles are very different. Speed lets you link most of your moves together to perform multi hit combos that look good and are fairly simple to execute, it also gives you the chance to do a desperation move and also a custom combo kind of thing which you move quicker and can link every move your character can perform. Power gives your characters moves a lot more power but you cant perform combos, however you can perform super desperation moves that are highly powerful and are rather cool to watch. The sound in this game is great with cool sound effects and voices, the stages music is also cool with some stages only having the sound of water running or the chatting voices of a big crowd. With all these attributes combined SNK has done a very good job and has given us one of the best 2d fighters ever made if not THE best.